This page is dedicated to controllers for the Amstrad DRX595 Sky HD box and the Amstrad DRX890W / DRX895W Sky+HD boxes with built in wifi. These controllers are primarily used with home automation units such as Crestron, Control4 or AMX. They connect to the 10 pin mini-din I/O port on the rear panel of the DRX595/DRX890W/DRX895W. If you are looking for a controller for an older Sky, Sky+ or Sky+HD box that has an RF2 port, please see our range of controllers that connect to the RF2 port. The protocol documentation is in the documentation section of this website. A Crestron driver is available from our software downloads page.A comprehensive driver for Control4 was developed by extravegetables and is now available as an official driver from Control4. A driver for RTI is available from Janus Technology - please email licensing@janustechnology.co.uk for details. Please note that we are not VAT registered, there is nothing to add on top of the below prices. This controller is capable of controlling one SkyHD (DRX595) or Sky+HD DRX890W/DRX895W box via a 8N1 RS232 connection (baud rate is configurable). Power is drawn from the SkyHD box connected to the controller via the same I/O port connection (10 pin mini-din) used to inject the controller signal. The protocol is identical to our RF2 controllers. These controllers can also be used with the DRX-595 to keep the Sky box fixed on a single channel, similar to how the Global SMC controllers did. A PC with an RS232 port is required to configure this, after that they run in a standalone mode. 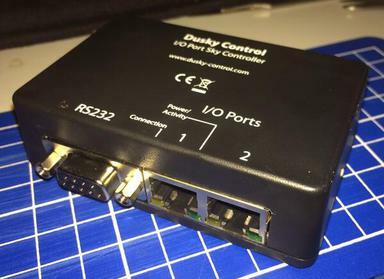 This controller is capable of controlling two SkyHD (DRX595) or Sky+HD DRX890W/DRX895W boxes via a 8N1 RS232 connection (baud rate is configurable). Power is drawn from any SkyHD box connected to the controller via the I/O port. The protocol is identical to our RF2 controllers. The cables to connect the controller to the Sky box I/O port are included. 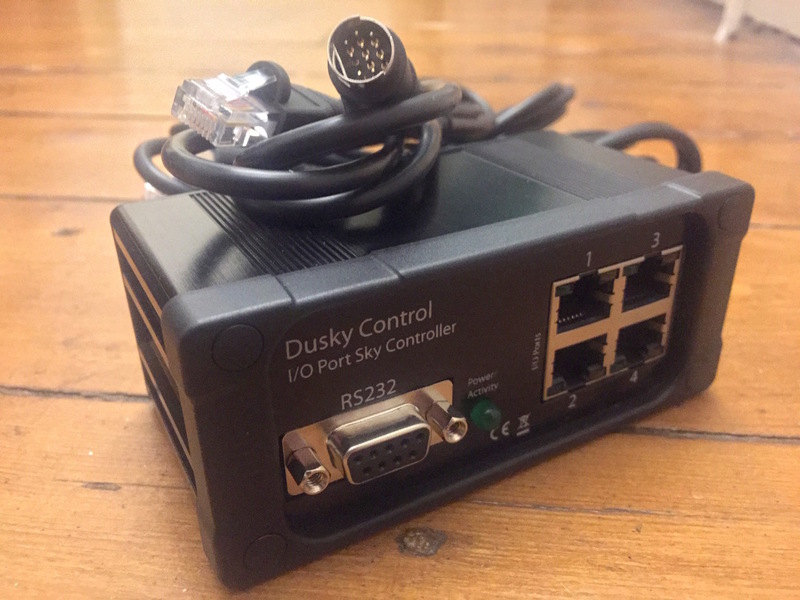 This controller is capable of controlling four SkyHD (DRX595) or Sky+HD DRX890W/DRX895W boxes via a 8N1 RS232 connection (baud rate is configurable). The protocol is identical to our RF2 controllers. The I/O port 10 pin mini din cables are included and are around 1.8 metres long. They connect to the controller using standard RJ45 connectors, and if necessary can be extended using standard RJ45 parts. This controller is capable of controlling eight SkyHD (DRX595) or Sky+HD DRX890W/DRX895W boxes via a 8N1 RS232 connection (baud rate is configurable). Power is drawn from any Sky box connected to the controller on the the first 4 ports. The protocol is identical to our RF2 controllers. The cables to connect the controller to the Sky box I/O port are included (not shown in photo). Dimensions: 225mm x 165mm (+connectors) x 40mm (+feet). With the feet removed the controller will fit on most 1U rack shelves. 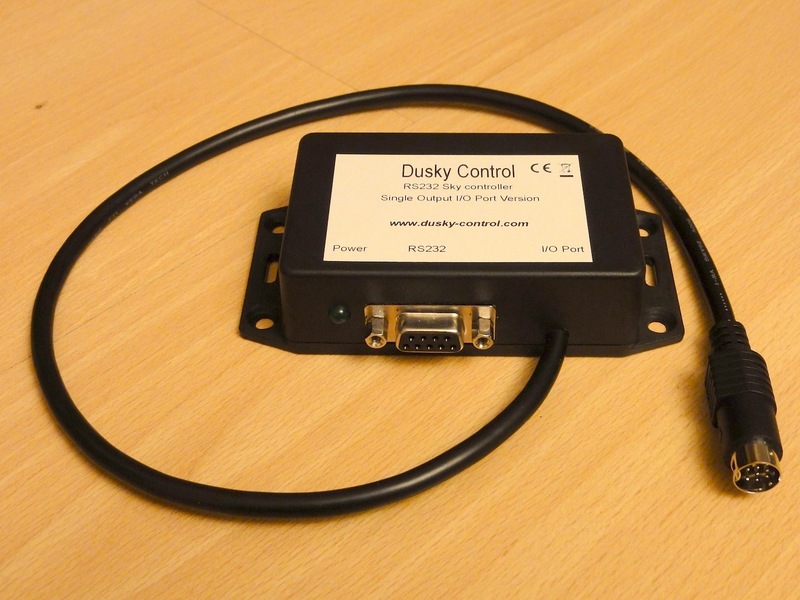 This controller is capable of controlling twelve SkyHD (DRX595) or Sky+HD DRX890W/DRX895W boxes via a 8N1 RS232 connection (baud rate is configurable).